We all know of the powers of almonds, the new IT food. They can be blanched, diced, sliced, slivered, ground in to flour, or processed into milk. They can be eaten in a variety of ways as well toasted, salted, smoked, or candied. 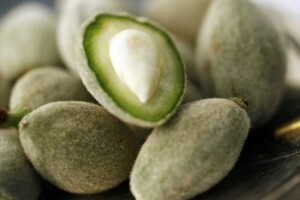 The almond is native to the Mediterranean region of middle east and referred to as Badam. There, they are often eaten whole while they are still fleshy before the shell has hardened. They are still green and sour in this form and often dipped in salt. If you ever have the opportunity to try this chagaleh badam, I highly recommend that you do. The flavor is unparalleled. The almond is rich in vitamins including multiple B and E vitamins as well as minerals calcium, iron, magnesium, potassium, and zinc. Additionally they are rich in dietary fiber and mono and poly unsaturated fats which may decrease cholesterol and increase HDL, the ‘good cholesterol’. 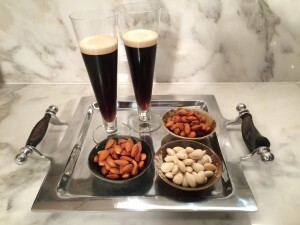 As fresh almonds are not within the reach of most of us, you can get a wonderful approximation at home. The recipe below results in a slightly sweet almond taste. 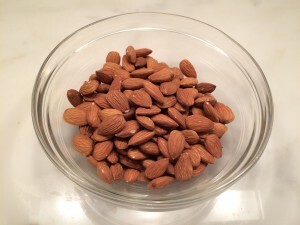 Place almonds in bowl and add water. The bowls here are from Duralex an may be one of my best kitchen investments ever. They come in an assortment of sizes and equally importantly are stackable so they use up very little space. After a few minutes, rinse the water away and refill the bowl with fresh water. Let sit at room temperature, or in refrigerator if you prefer. When the water becomes cloudy, rinse the nuts until the water runs clear. Fill the bowl with water again. 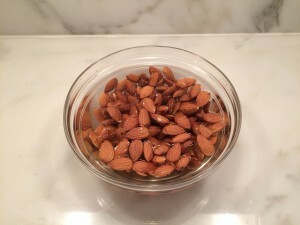 In 36 hours you should have recreated ‘fresh almonds’. You can eat them as is or you can peel the skin. I recommend you try it both ways as they are each delicious but slightly different in taste. You may also salt if desired. 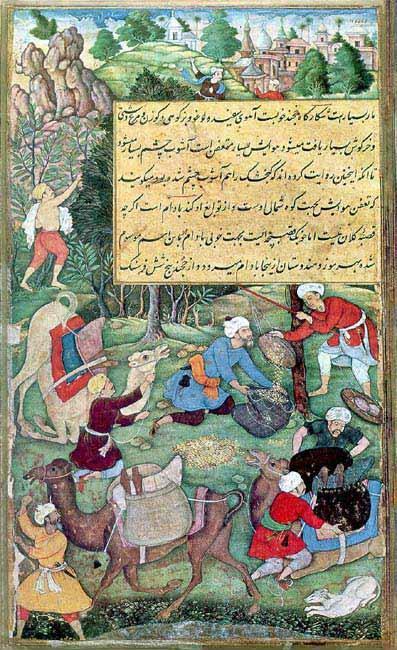 Feature image “Harvesting of the almond crop at Qand-i Badam, Fergana Valley (16th century) Bhawani (1590s) Baburnama.